INTRODUCTION: Pyrimidine is the basic nucleus in DNA & RNA, it has been found to be associated with diverse biological activities. The presence of a pyrimidine ring in thymine, cytosine and uracil, which are the essential building blocks of nucleic acids, DNA and RNA is one of the possible reasons for their activities. Vitamins are essential for body. Pyrimidine ring is found in vitamins like riboflavin, thiamine and folic acid. Dihydropyrimidinones, the products of the Biginelli reaction, are widely used in the pharmaceutical industry as antimicrobial agents 1, 2, 3, antitumour agents 4, calcium channel blockers 5, antihypertensive agents 6 and alpha-1 antagonists. Inspired from these observations, it was planned to synthesize some maleic anhydride substituted pyrimidine derivatives and evaluate their antimicrobial activity. Dihydropyrimidines were prepared by Biginelli reaction using various substituted benzaldehydes which was then treated with hydrazine hydrate to afford carbohydrazido derivatives and was finally condensed with maleic anhydride to afford maleic anhydride substituted dihydropyrimidine derivatives. MATERIALS AND METHODS: All the solvents and reagents were of laboratory grade. The melting points of the titled compounds were determined by open capillary method and were uncorrected. The purity of the compounds was checked by thin layer chromatography. The infrared analysis was carried out by JASCO 4100 FT IR using KBr pellet disc technique 7. 1H-NMR was recorded on a Brucker 500MHz spectrometer using tetramethylsilane as standard 8. The chemical shifts were recorded in parts per million (ppm). Synthesis of Biginelli Compound: A mixture of 0.15mole of thiourea, 0.1mole of ethylacetoacetate and 0.1mole of benzaldehyde were dissolved in 25ml of ethanol along with 3 drops of conc.HCl and refluxed for one and half an hour. The reaction mixture was then poured into 100ml ice cold water with stirring and left overnight at room temperature, filtered and dried. The products were recrystallised using ethanol. 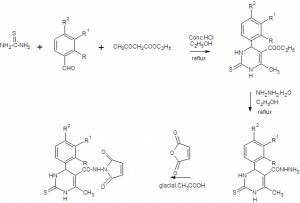 Similar procedure was followed for various substituted aldehydes. Synthesis of Carbohydrazido Derivative: A mixture of 0.1mole of biginelli compound and 0.1mole of hydrazine hydrate were dissolved in 20ml of ethanol along with 4 drops of conc.H2SO4 and refluxed for 3 hrs. The reaction mixture was then evaporated to obtain a residue which was further recrystallised from ethanol. 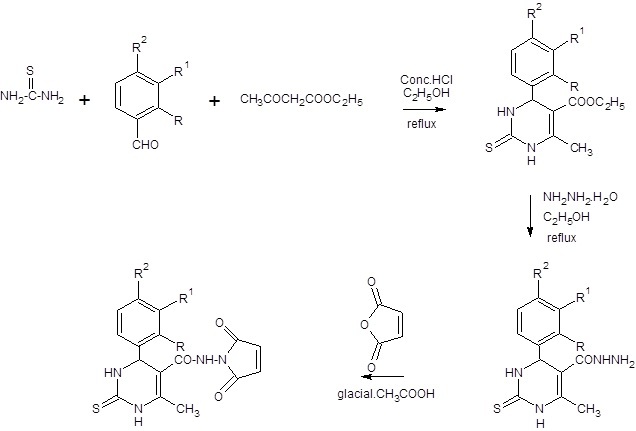 Synthesis of Substituted Dihydro Pyrimidine Derivatives: About 0.5gm of hydrazido product and 0.5gm of maleic anhydride, 5ml of glacial acetic aceid were refluxed for one hour. The reaction mixture was then poured into ice cold water in a beaker, filtered and dried. The precipitate was then recrystallised from ethanol. Antimicrobial Screening: All the titled compounds were screened for antimicrobial activity against Bacillus subtilis, Staphylococcus albus, Salmonella paratyphi, Pseudomonas aeruginosa, Candida albicans, Aspergillus parasitis using disc diffusion method. The synthesized compounds were dissolved in dimethyl sulfoxide to a final concentration of 100µg/ml. The sterile discs (6mm in diameter) were impregnated with 10µg of the sample and test against microbial cultures. Ciprofloxacin (10µg/ml) disc was used as positive reference standard for antibacterial activity 9. All petriplates were incubated at 37oC for 24hours. After incubation, diameter of inhibition was measured. Cotrimazole (10µg/ml) was used as positive reference standard for antifungal activity 10. All petriplates were incubated at 27oC for 72 hours. After incubation, diameter of zone of inhibition was measured. CONCLUSION: The present study describes the synthesis of novel dihydropyrimidine derivatives via Biginelli reaction and evaluation for antimicrobial activity. The purity of the titled compounds was checked using melting point and thin layer chromatography. The structures of the compounds were assigned based upon the spectral data. The IR and 1HNMR data showed that the compounds were found to have the expected peak signal. The antimicrobial studies showed that the titled compounds have moderate antibacterial activity and a good pronounced antifungal activity. Lynn S. Gossett, Lillian L. Habeck, Katherine A., Shackelford, Laurane G, Mendelsohn, Susan B. Gates, John F. Worzalla, Tracy D, Self, Karla S. Theobald, Sherri L. Andis, Richard M. Schultz and Chuan Shih, Bioorganic & Medicinal Chemistry Letters, 1999; 9:75-78. Saritha Jyostna Tangeda, Achaiah Garlapati, European Journal of Medicinal 2010; 45:1453-1458. Rajendra Prasad, K.K. Rajasekher, V. Shankarananth, S.Ch. Maulaali, G.S.S. Pradeep Kumar And K.Narender Reddy. Journal of Pharmacy Research, 2010; 3(9): 2291-2292. Silvia Schenone, Olga Bruno, Francesco Bondavalli, Angelo Ranise, Luisa Mosti, Giulia Menozzi, Paola Fossa, Sandra Donnini, Annalisa Santoro, Marina Ziche, Fabrizio Manetti and Maurizio Botta, European Journal of Medicinal Chemistry, 2004; 39: 939-946. Leena Gupta, Naresh Sunduru, Aditya Verma, Saumya Srivastava, Suman Gupta, Neena Goyal And Prem M.S. Chauhan, European Journal of Medicinal Chemistry, 2010; 45: 2359-2365. Nidhi Agarwal, Sandeep K. Raghuwanshi, D. N. Upadhyay, P. K. Shukla And Vishnu J. Ram. Bioorganic & Medicinal Chemistry Letters, 2000; 10: 703-706. Robert M. Silverstein, Francis X Webster.Spectrometric Identification of Organic Compounds, John Wiley and Sons, 6th Edition 2007; 71-143, 144-216. David G.Watson, Pharmaceutical Analysis, 2nd Edition, Elsevier Publication, 2005; 315-328. Gerard J Tortora, Berdell R Funke, Christine L Case, Microbiology, 9th Edition, Pearson education Publication. 2007; 178-199. S. Purohit, Microbiology, 7th Edition,Agrobios(India), 2006; 795-796. Beena KP and Akelesh T: Design, Synthesis and Evaluation of Some Novel Dihydropyrimidine Derivatives as Possible Antimicrobial Agents. Int J Pharm Sci Res. 3(12); 4919-4921.